South American Mystery Novels and Stuff: Where Do Roger and Suzanne Hang Out? (1) "The Empanada Affair" 3 stars, $0.99, a Kindle E-book mystery novel set in Salta, in Northwest Argentina is available on Amazon at http://www.amazon.com/The-Empanada-Affair ebook/dp/B005BFCVYW/ref=sr_1_1?s=books&ie=UTF8&qid=1312339722&sr=1-1, as well as through Amazon DE and UK, Smashwords at https://www.smashwords.com/books/view/77930, and directly from Apple (iPad, iPhone), Barnes and Noble (Nook), Kobo, etc. This is the first book in the Roger Bowman and Suzanne Foster South American mysteries series. The Empanada Affair is a hard-boiled thriller, featuring Private Detective Roger Bowman and Scientist Suzanne Foster trying to solve the mystery of who murdered Suzanne's father while he was visiting Salta in Northwest Argentina. The book features a whodunit mystery, travel through the region, local food and wine, and a steamy romance that begins on the long flight south from California. (2) "The Ambivalent Corpse" is available for only $2.99 as a Kindle E-book from Amazon at http://www.amazon.com/Ambivalent-Corpse-Crime-Meant-ebook/dp/B0060ZFRQG/ref=sr_1_1?s=books&ie=UTF8&qid=1319989507&sr=1-1, from Amazon UK, DE, FR, and ES, and in other convenient formats from Smashwords at http://www.smashwords.com/books/view/100325. The book is also available for Apple iPhones and iPads at the iBook store, for Nook readers at http://www.barnesandnoble.com/s/the-ambivalent-corpse?keyword=the+ambivalent+corpse&store=ebook, and for Kobo readers at http://www.kobobooks.com/search/search.html?q=The+ambivalent+corpse. This fast paced mystery book set in Montevideo, the capital city of Uruguay, and Iguazu Falls, on the border of Brazil, Argentina, and Paraguay, has garnered multiple four 4- and 5-star reviews. The Ambivalent Corpse is set mainly in Montevideo, Uruguay. Roger and Suzanne find parts of a dismembered corpse on a rocky stretch of beach in Montevideo, apportioned equally between the Memorial to a German cruiser sunk in World War II and the Memorial to Jews killed in the Holocaust. Because of the murder victim's strategic location shared between two antithetical monuments, the Uruguayan press names her “The Ambivalent Corpse”. Private detective Roger Bowman and his girlfriend, scientist Suzanne Foster, find themselves traveling through Uruguay, Southwest Brazil, and parts of Paraguay and Argentina to help solve the case. Along the way they experience the local tourist attractions, lots of intrigue, and a complex murder mystery that Suzanne and Roger both play essential roles in solving. The plot races along at a rapid pace that makes this book very difficult to put down once you've started reading it. Start early if you want to get a full night's sleep. This fast paced mystery has plenty of action, atmosphere, and sense of place. While the novel is basically a hard-boiled mystery story, it bends the genre slightly so that it should also appeal to readers interested in travel, romance, Indigenous creation legends, and South American food and wine. THE SURREAL KILLER, 5 Star reviews, is the third Roger Bowman-Suzanne Foster South American mystery novel in the series, and is presently available only as a Kindle E-Book from Amazon (+Amazon UK and DE) for $2.99 at http://www.amazon.com/The-Surreal-Killer-ebook/dp/B007H21EFO/ref=sr_1_2?s=books&ie=UTF8&qid=1330988453&sr=1-2. The book is currently free for Amazon Prime members to borrow. A serial killer is leaving a trail of dead women across Chile, Peru, and Bolivia. The gruesome corpses all seem to have died in exactly the same macabre way. There may be a link to a small group of scientists who meet annually in different locations in the region. Roger Bowman and Suzanne Foster are asked by the local police to attend this year’s meeting of the group in Lima, Peru to try to find out who was present at the previous meetings when the murders occurred. 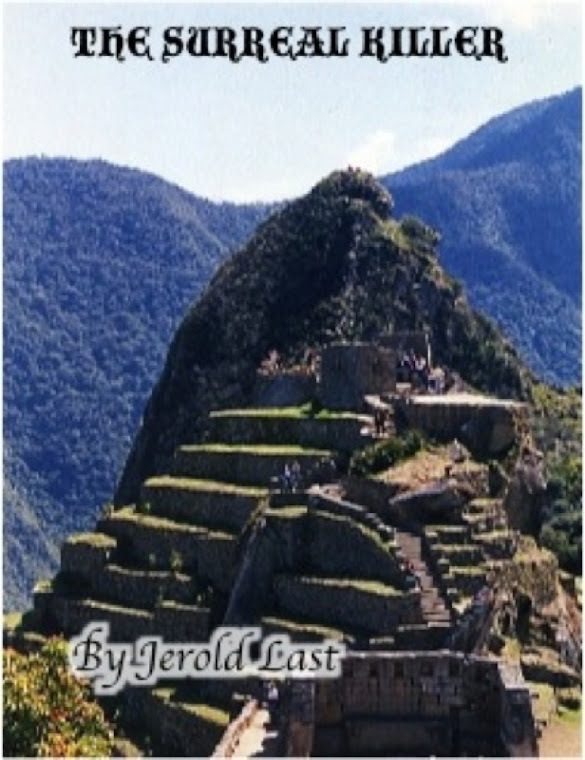 And the reader is off on a fast paced pursuit of the killer through Lima, Cuzco, and Machu Picchu in Peru and Chile’s Atacama Desert. This is a true whodunit mystery novel set in an unusual and exotic locale. This tightly written mystery story will keep you guessing all the way to the thrilling conclusion.